Treatment isn’t enough to keep ulcerative colitis relapses at bay; dietary factors play in an important role in flares as well. New research identifies foods that patients should stay away from. The Diet’s Role in Exacerbations of Mesalamine Maintenance (DREAM) study included 25 sites and 412 patients with mild to moderate ulcerative colitis. All participants were on monotherapy with mesalamine and had not experienced a disease flare in three months – but had experienced one within the previous 18 months. The researchers contacted them every three months for one year to record food intake and disease activity. The data was revealed in a presentation at Digestive Disease Week (DDW) 2016 in San Diego, California on May 21. MD Magazine is on Facebook, Twitter, Instagram, and LinkedIn! A total of 45 out of the 412 participants (11%) had a relapse during the one-year study time. “When intake of specific food groups and macronutrients were analyzed in tertiles of intake, individuals in the highest teritiles demonstrated significantly increased odds of relapse in multiple categories, including several groups of fatty acids, dairy protein, lysine, and alanine,” the authors explained. 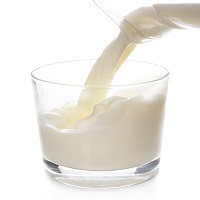 Further analysis using a multivariable logistic regression confirmed that higher intake of lactose, alpha linolenic fatty acid, and myristic fatty acid was associated with an increased risk of relapse. Previous research has found that other foods such as processed meat, alcohol, and foods with high amounts of sulfur content (like cruciferous vegetables including cauliflower and broccoli, as well as dairy and eggs) increased the risk of ulcerative colitis relapses. Interestingly, this study did not demonstrate that they caused such disease activity. While further evaluation is needed, it appears that high intake of alpha linolenic and myristic fatty acids – found in dairy fat and coconut oil – can increase the risk of ulcerative colitis flares. Therefore, modifying dietary choices to avoid these foods may help patients.